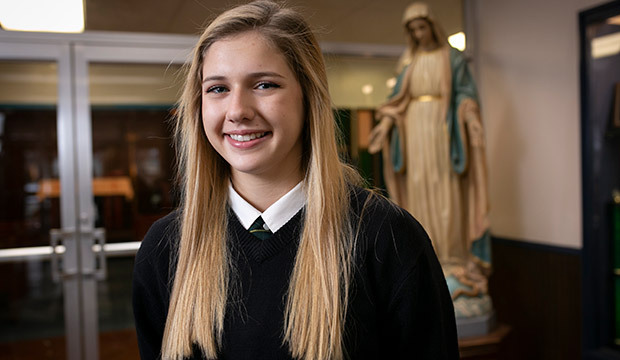 WICHITA FALLS — Known throughout Notre Dame Catholic School for her welcoming and energetic personality, senior Ellen Parkey is as at home leading cheers as she is leading others in need of encouragement. Abel, who taught Parkey chemistry two years ago, said she remains a standout student on his teaching roster. Notre Dame is composed of an elementary school for students in pre-kindergarten through fifth grade; a middle school for sixth, seventh, and eighth grade students; and a high school for students in the ninth through 12th grades. The traditions of the institution are drawn from the Sisters of St. Mary of Namur who, in 1904, founded the original school that was known as the Academy of Mary Immaculate, and the Congregation of the Holy Cross, who joined the Sisters of St. Mary when the school was broadened to include high school age boys. Principal Michael Edghill said the school has a staff of 40, with 43 of its 195 students in high school. Parkey, 18, has been a student there since kindergarten. Her parents, Robert, a physician at Hospice of Wichita Falls, and her mother, Katie, a nurse, raised two other daughters who graduated from Notre Dame, Rachel and Alex. The teenager is a cantor at Mass and a sacristan. She also is in the school choir and sings and plays the guitar at the local Rebirth Retreat for Catholic youth. Abel made his nomination after talking with other staff who wholeheartedly echoed his choice. “She is very giving and easy to be with,” Abel said. 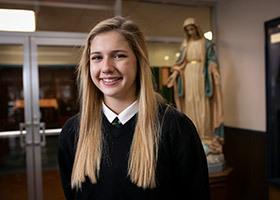 Parkey’s resume includes National Honor Society, student council president, cheer captain, captain of the basketball team, and member of the school’s softball, basketball, and volleyball teams. She is also first violin with the Wichita Falls Youth Symphony. Parkey said her faith is paramount.